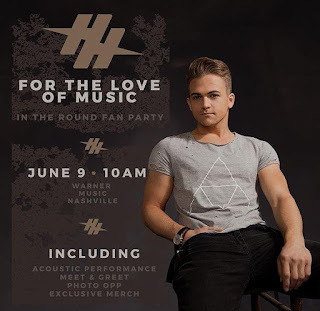 Hunter Hayes Announces "For The Love Of Music" Fan Party! Tickets On Sale Now! Join Hunter Hayes on Friday, June 9, 2017 at 10 AM for a once-in-a-lifetime exclusive Music Fest experience at Hunter’s record label headquarters – Warner Music Nashville – where you will enjoy a super-intimate acoustic, in-the-round performance from Hunter (and some incredible special guests! ), as well as a Q&A session, Meet & Greet, Photo Op, and Limited-Edition Event Merchandise.